In baseball, retaliation is expected. Ill-timed stolen bases, drilled teammates, questionable slides: They all qualify for reciprocal strikes. At this point in the story, Indians pitcher Carlos Carrasco had three options: wait for the next time he faced Cabrera, when he could teach him a lesson; drill the following hitter, Billy Butler, because pissed-off teammates are frequently even more effective than direct retribution; or ignore the matter entirely. Carrasco chose none of the above. What he did sort of resembled the second option, but although he threw at Butler, in so doing he violated an unwritten rule that holds far more weight than Cabrera’s theatrics. 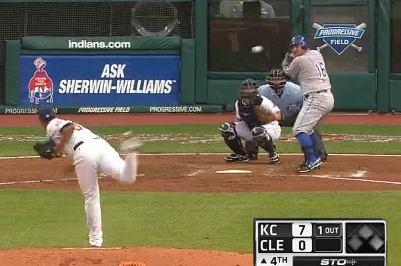 The Cleveland right-hander threw at Butler’s head. It was a reaction borne of clear frustration: Cabrera’s blast served as the fourth, fifth, sixth and seventh runs Carrasco had given up in 3.1 innings. Two of those runs had come in the first, courtesy of a Butler home run. Plate umpire Scott Barry immediately ejected the pitcher. Indians catcher Lou Marson cut off Butler in case he had thoughts of settling things then and there, and the benches quickly emptied. No punches were thrown, but as players filtered back to their dugouts, Carrasco got into a shouting match with Jeff Francoeur, who angrily pointed toward his hip, indicating where the pitch should have gone. Even more importantly, just as such an action could have served to set Cabrera straight by angering his own teammate, Carrasco’s stupidity has put a similar onus on the Indians. Kansas City has every right to retaliate, but because of the DH it’ll be another member of the Indians who wears one on Carrasco’s behalf. There will likely never be a mention of it in the press, but when it happens it won’t be met kindly within Cleveland’s clubhouse. After Carrasco’s display, Indians pitching coach Tim Belcher cornered him and elucidated the repercussions of what he’d done. The Indians, shockingly, perhaps felt further need to respond to Cabrera; when he came up with the bases loaded in the fifth, reliever Chad Durbin greeted him with a high, inside fastball. Even in the Royals clubhouse, players acknowledged that the center fielder will be instructed to speed up future home run trots. Both the initial parties issued standard denials, with Carrasco saying the fastball got away from him (although he did admit to having noticed Cabrera’s pimp work), and Cabrera insisting that disrespecting the pitcher was the furthest thing from his mind. That, of course, is hogwash. The Royals will almost certainly notify him of that at the next available opportunity. Interesting. It’s so weird how it all works. Like the ridiculous Orioles-Sox thing a few weeks ago. But I was reading about how difficult it is to actually hit a batter… some of these pitchers sure do make it look easy. The whole Cabrera / Carrasco scenario was a hoot.Melky was way proud…but quickly went into his trot when Carrasco looked back at home plate after watching it fly.You could tell Carrasco’s “internal timer” had expected to see Melky in full trot split seconds faster.When that did’nt happen-Butler was doomed. Dumb. Melky barely watched it. what’s the point in playing if you can’t enjoy any part of the game for a brief second. Its one thing to pull a big poppy but this was a joke. Players now a days play more for money than the enjoyment of the game. I watched the replay plenty of times, and your use of “pimping” is erroneous. It can be a fine line to walk for some players because everybody views these things differently. You can get away driving 10 mph over the speed limit … until you pass the cop with the radar gun. The fact that Carrasco was clearly frustrated also has a lot (hell, maybe everything) to do with it.